The nominations were by peers, meaning people somehow connected with writing and/or publishing. But the voting is open for the public. The Invisible Hands – Part 4: Mate, Book VII in the Dark Tales of Randamor the Recluse series is a finalist in Best Fantasy (High Fantasy/Sword and Sorcery). You can see how I’m doing (and vote) by following the link. The free anthology Stories on the Go: 101 Very Short Stories by 101 Authors of which I was the editor is also among the finalist in its category Best Anthology. 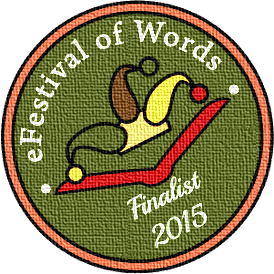 Here you can find all the finalists of the 2015 eFestival of Words. I’m pleased to see this year as well a lot of people I know got through to the finals. Gastien: From Dream to Destiny by my friend Caddy Rowland, to name only one, is a finalist in both Best Novel and Best Historical Fiction. Now it’s up to the public to vote. I can’t add much more to what I already said last year: I just feel lucky, not to mention honored, to have gotten this far as a finalist. I have no idea who voted for my books and the cover, but they have my heartfelt thanks. I think the voting will end by August 1st, so if you’re inclined to vote don’t wait too long. And, of course, many thanks to organizer Julie Dawson. Thanks for the mention, Andrew. And good luck!